If you preach, teach Bible studies, or facilitate discussions in any manner, you know how important it is to communicate your message effectively. For those of you who speak in front of people I think you will find this resource very helpful. The best part is that right now it’s on sale for only $14.95 (almost 50% off). Get it for yourself of for someone you know that needs it. I have it and I recommend it. Even if you think you are already good, you can always get better. 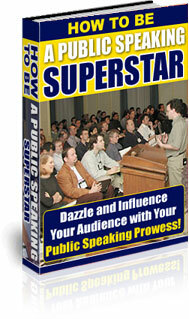 How to be a Public Speaking Superstar will show you how to develop public speaking skills which will draw out enthusiastic responses from the bottom of people’s hearts and stimulate them to action. Do you want to be a more effective public speaker? Do you want to experience the satisfying feeling of being able to conquer your fear and deliver memorable speeches with confidence? Do you want to move multitudes of people to a certain course of action? If so, then wait no longer. Grab your ticket to public speaking greatness and let yourself be heard. Remember, this resource is on sale for only $14.95 plus it comes with a 90-day money back guarantee. Here’s the bottom line. If you don’t have the time or money to get yourself personalized training and attend expensive seminars in public speaking, click here and order your copy right now. You’ll be glad you did and especially those in your audience.